All Aboard! 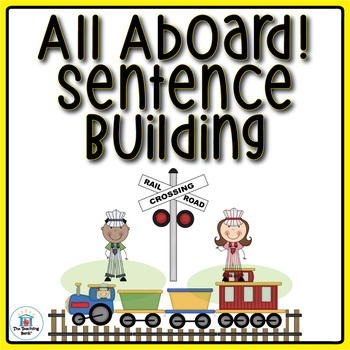 Sentence Building is a Common Core Standard aligned activity for students to practice building complete sentences with high-frequency words.You can use these activities as manipulatives in a learning center or you can create file folder games. •Cover sheet, teacher instructions, and student directions. •108 Engine cars with capitalized sentence beginning words. 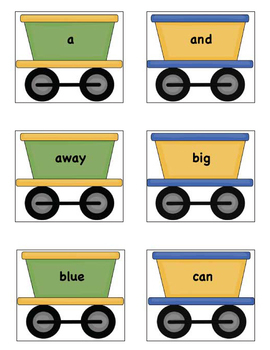 •315 green train cars that contain 220 sight words and 95 common nouns. •315 yellow train cars that contain 220 sight words and 95 common nouns. 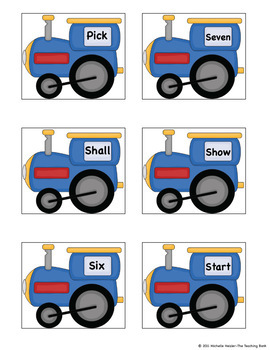 •18 Caboose cars that have 6 periods, 6 question marks, and 6 exclamation points for sentence ending. •3 Pages that contain 6 blank engine cars, 6 blank green train cars, and 6 blank yellow train cars to add your own words to the center. **Note this is the only editable portion of the file. •Clip art for train crossing sign and railroad tracks to use as needed. •2 Versions of themed stationery for the student that coordinates with the activity. •Common Core Standard Checklists for grades K-4.